We all know that grasslands are open areas, where trees are few and grasses are the dominant plants. But can you tell the difference between the different types of grasslands in Missouri? Grasslands, obviously, are grassy, open areas with few trees or none. Missouri has lots of land that fits this category, but these places are absolutely not all alike. How do ecologists distinguish among them? One big distinction is between altered, disturbed habitats and those that are native grasslands, not substantially changed from the way they were before American settlers altered the landscape. Many of these altered or disturbed lands used to be native tallgrass prairie, especially in northern and western Missouri, but plowing destroyed the original prairie plants, and people planted fescue and other grasses for cattle. Most of the grasses that dominate pastures and old fields are cool-season grasses, which turn green and grow quickly in springtime, then dry and go dormant in our hot, droughty summers, and then renew growth again in fall’s return to cooler weather. Most pastures, old fields, and other altered grasslands might look “wild,” but from an ecologist’s perspective, they amount to a landscape of non-native, rapid-growing plants. To many species of grassland wildlife, these fields cannot offer the richly varied food sources, nesting sites, and shelter they would get from native grasslands. The ground cover of both prairies and savannas is dominated by our native warm-season grasses, such as big and little bluestem, Indian grass, and sideoats grama. Warm-season grasses are beautifully adapted to our Missouri climate by having chemical processes allowing them to photosynthesize most efficiently during our hottest, driest months — so they are green, lush, and growing vigorously in midsummer while cool-season grasses go dormant. Only a handful of savanna landscapes remain in Missouri, surviving where prairies transition into woodland. Compared to the non-native, altered grasslands such as pastures and old fields, prairies and savannas have a staggering — and beautiful! — diversity of plant species, even on a relatively small patch of land. Counting both grasses and forbs, a 100-acre high-quality remnant of native prairie can support at least 200 native plant species, with as many as 20 species growing within a single square yard of ground! With so many types of plants, a large variety of animals are supported, too. Many plants and animals that live on native prairies and savannas cannot live anywhere else on earth. Each remaining fragment of native grassland is like Noah’s ark, protecting a vast diversity of plant and animal species, many of which are endangered. Examples range from Mead’s milkweed to the greater prairie-chicken. This is one very important reason for prairie and savanna conservation. With a little practice, you can learn to recognize the distinctive look of a prairie even from a speeding automobile: In the hot middle of summer, prairies will be green and have a “scruffy” look because of the variety of colors, sizes, and textures of their many different plants. Savannas have many of the same species as prairies, but with their scattered trees, they have a parklike look. They often occur as openings in woodlands or on cool, moist slopes amid prairieland. Two other native habitat types resemble grasslands: wetlands and glades. Glades, which often have grasses and forbs we associate with prairies, usually occur in the Ozarks, usually on hilltops and other upland places with sunny, hot exposures, typically are openings surrounded by woodland or savanna, and have thin soils with plenty of exposed bedrock. Wetlands are in low areas where soils are saturated with groundwater, often have standing water above the ground, and where aquatic plants make up a large percentage of the flora. At their edges, wetlands often grade into bottomland prairie, bottomland forest, and so on. What Makes Prairies and Savannas? Why are prairies and savannas where they are? What makes them? And what’s the fuss about prescribed fire? As with all habitat types, it takes a combination of factors. Missouri occurs just to the east of the Great Plains of North America, one of the world’s greatest grasslands. This eastern reach of the Great Plains has the tallest grasses. As you move westward, the average size of the grasses decreases. That’s why we call our types of prairie tallgrass prairies, while the ones to our west (Kansas, Nebraska, the Dakotas, and beyond) are called midgrass or mixed-grass and, farther west, shortgrass prairies. The main difference is moisture: our climate is wetter, supporting more and taller vegetation than the drier lands to our west. Moving east across America, as moisture increases, the grasslands eventually transform into wooded areas, typical of the eastern United States. Missouri is part of a transition zone, and our natural habitats range from virtually treeless prairie through true forest, which is 100 percent covered by tree canopy. A complex patchwork of intermediate habitats — savannas, glades, and woodlands — form the transition zones between the two extremes, based on varying soil depths, rock types, elevation, slope, angle to the sun, water drainage patterns, and so on. With the amount of moisture available here, much of Missouri’s landscape, if left perfectly alone, would eventually turn into forest. First the cedars, sumacs, honey locusts, and other pioneer tree species appear; then oaks, hickories, maples, and other slower-growing trees eventually take over. However, for thousands of years, both natural and human-caused disturbances have kept our open places open — since about the end of the last ice age. Native grasses are adapted to grazing by buffalo, and the grazing and trampling by former vast herds of these animals played a role in keeping wooded plants from becoming established. But fire is the most important factor in the long-term maintenance of prairies, savannas, and woodlands. Native Americans long ago learned to manage grasslands for buffalo by using fire. Perhaps they learned to do this by observing prairie fires that had been started accidentally from a campfire, or by a lightning strike, and noting the effects it had. And those were indeed regular causes of prairie fires. Native Americans also knew that burning the grasses during the dormant season made travel and hunting easier. It also stimulated the plants to produce new growth, which was good for the grazing animals they hunted. Burning grasses on purpose also created open, low-fuel areas less likely to catch fire near habitations, and prairies were also doubtlessly ignited sometimes as an act of warfare toward rival groups. For thousands of years, fire kept the prairies from becoming wooded. The species that live on native prairie lands are adapted to occasional fires. Savannas developed on areas near prairies where trees were able to make a toehold and remain — on slopes facing northeast, where it was slightly moister and cooler, for example. Even though fires occasionally sweep through savannas and kill young wooded plants, a handful of trees survive to reach a size that enables them to withstand the fires. Woodlands, too, experience fires that reduce the understory of small woody trees and shrubs, maintain a grassy ground cover, and fail to eliminate the largest trees. Many plants and animals that live in open, sunny, grassy areas can live in both altered, disturbed grasslands as well as native grasslands. Wide-ranging animals like mammals, birds, and insects often can move about among various open, grassy habitats. Examples of animals that can live in almost any grassy, open area include black-and-yellow garden spider, differential grasshopper, great spangled fritillary butterfly, dickcissel, bobolink, brown-headed cowbird, and scissor-tailed flycatcher, eastern cottontail, and coyote. But animals that are tied to certain plant species, plant communities, or environmental conditions found only on tallgrass prairies or savannas can survive and thrive only on tallgrass prairies or savannas. Examples of prairie specialists include the regal fritillary butterfly, pink katydid, grasshopper and Henslow’s sparrows, and greater prairie-chicken. Many native prairie species are interconnected so closely that the disappearance of one could mean the end of others. The grassland (or prairie) crayfish, for instance, builds burrows into the ground that can be six feet deep; northern crawfish frogs and other animals use these tunnels as cool retreats in hot, dry weather. The American bison once ranged through the Great Plains in enormous herds. These animals could quickly and completely graze an area, but because the tallgrass prairie ecosystem was so vast, the bison could migrate constantly to ungrazed areas. In fact, their occasional, random trampling and stripping of vegetation from lands was one of the natural disturbances, like fire, that maintained the prairie ecosystem, preventing trees from getting established. The dominant plants on our native prairies and savannas are warm-season grasses, as mentioned above. There is a mind-boggling variety of native grasses, but big and little bluestem, Indian grass, and sideoats grama are the superstars. Their chemical pathways for photosynthesis make them especially efficient for harvesting the sun’s energy in midsummer. Aster family: American feverfew, Ashy sunflower, compass plant, coneflowers, blazing stars, prairie dock, and purple-headed sneezeweed. Pea family: goat’s rue, long-bracted wild indigo, purple prairie clover, sensitive briar, white wild indigo, and leadplant. Also: blue-eyed grass, celestial lily, closed gentian, field milkwort, hoary puccoon, Indian paintbrush, prairie alum root, prairie parsley, rattlesnake master, rose gentian, wild hyacinth, wood betony, yarrow — and many, many more. Tall fescue thrives in disturbed, altered, and degraded habitats. It's technically an exotic, invasive plant. 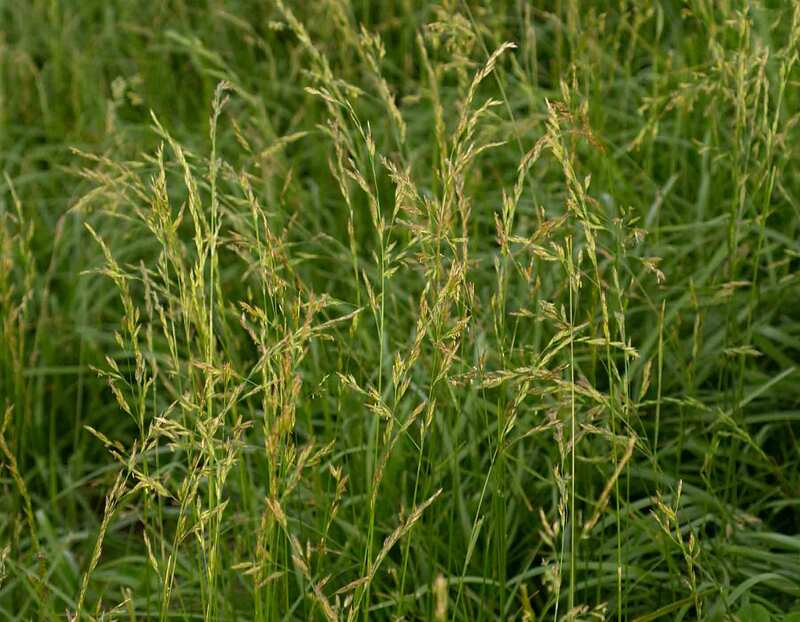 Grasses common in disturbed or altered grassy areas, such as roadsides and pastures, include tall fescue, orchard grass, smooth brome, reed canary grass, Kentucky bluegrass, Timothy, broomsedge, and Johnson grass. Many of these are cool-season species, doing most of their growth during spring and fall, and many are not native to North America. Also: common horse gentian, common water hemlock, field cress, garlic mustard, hedge parsley, henbit, hogwort, horse nettle, ironweeds, leafy spurge, moth mullein, mullein, Queen Anne’s lace, self-heal, soapwort, teasels, tick trefoils, yellow rocket — and many, many more. Missouri's native prairies used to spread across nearly all of the northern and western parts of the state; much of this land has been converted to cropland. Native savannas used to occur in these regions, too, as well as in the rest of the state. Of course, disturbed grasslands (pastures, hay meadows, old fields, grassy roadsides, and so on) occur statewide. Mecaphesa spp. and Misumessus spp.